The Willowton Queen Bed, Dresser, Mirror and Nightstand by Signature Design by Ashley at Miskelly Furniture in the Jackson, Pearl, Madison, Ridgeland, Flowood Mississippi area. Product availability may vary. Contact us for the most current availability on this product. Handles & Hardware Ring pull hardware in an antique brass color on white finished pieces and antique grey color on brown finished pieces. Both are accented with white paint hang up. 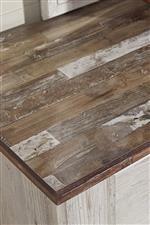 Case Construction Laminate with replicated oak worn through paint with authentic touch. 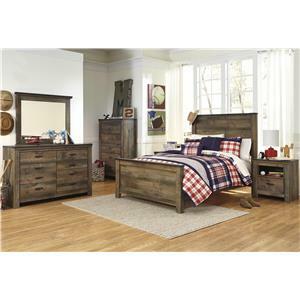 Hints of rustic, cottage, and casual style, this collection will add a refreshing feel to any bedroom space. 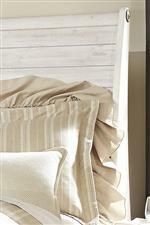 Classic details complement the light washed white finish. 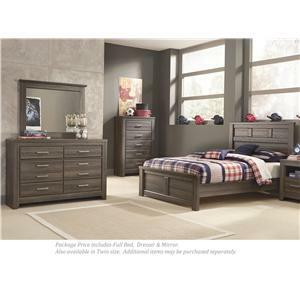 Create the look of a casual retreat in your home with your choice of pieces. The Willowton collection is a great option if you are looking for Rustic Relaxed Vintage Cottage furniture in the Jackson, Pearl, Madison, Ridgeland, Flowood Mississippi area. 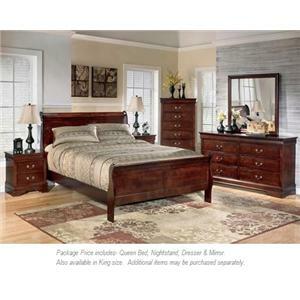 Browse other items in the Willowton collection from Miskelly Furniture in the Jackson, Pearl, Madison, Ridgeland, Flowood Mississippi area.